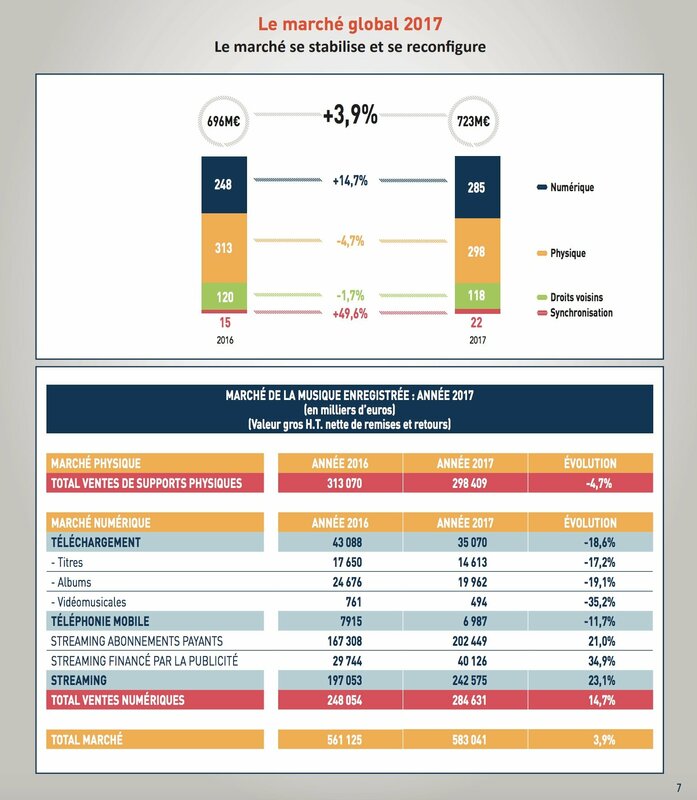 The French recorded music market grew its revenues by 3.9% in 2017, with total annual sales up €22m to €583m, marking the second consecutive year of growth. According to data from SNEP, the rise is thanks to a 23% increase in money earned from streaming, which was up €46m year on year to reach €243m in 2017, counting for 41.6% of the market. Of that figure, €203m was generated by premium subscriptions (83.5%) with €40m coming from ad-funded tiers. Ad-funded grew at a faster rate of 33%, however, while subscription income rose 21%. Subscriber numbers were up to 4.4m from 3.9m in 2016 in France. Digital (including streaming) took a 49% share of the recorded music market, a small percentage of which (6%) is downloads, which dropped sharply by 18.6%. Physical still counts for the majority of revenues with a marketshare of 51.2%, which was down 4.7% to €298m. Vinyl is up for the sixth year in a row and represents 12.2% of the turnover of the physical market (7.3% in 2016). The entire music market, which includes income from sync and performance rights, also rose 3.9% by €27m in 2017, totalling €723m. Of that overall number, performance rights earned €118m or 16% after declining 1.7% from 2016. Sync saw the biggest rise of 49.6%, earning €22m—just over 3%. Physical has a 41% share and digital follows closely behind at 39%. After experiencing a dip from 2013 to last year, when video streaming counted for 16% and then 7% of the streaming income market, it was on the rise again in 2017, up to 11%. In 2016, the market made €561m from recorded music. SNEP appears to have restated its 2016 revenue figure, which was originally reported at €449.56m. Recorded music market sales are down 27% from ten years ago, when the market earned €798m. A long period of decline has taken place since 2002, with the market finally returning to growth in 2016. Director General of SNEP, Guillaume Leblanc, said: “The efforts of the producers and the whole industry are paying, this recovery is encouraging, but it is fragile. Over the past four years, streaming income in France has slowed, grown and slowed again. In 2013 it was €89m, rising 37% to 2014, 14.7% from 2014 to 2015, 40% from 2015 to 2016 and 23% from 2016 to 2017. The biggest selling album in France last year was Ed Sheeran’s Divide (WMG), followed by Soprano (pictured) with L’Everest (WMG), Niska’s Commando (UMG), Vianney’s self-titled set (Wagram) and Damso with Ipséité (UMG). Thierry Chassagne, President of Warner Music France added: “Streaming is helping drive the whole French music market. But it’s important to look at what’s driving streaming. “A new generation of urban artists, including Warner Music’s Ninho, Hornet La Frappe, Aya Nakamura and Sadek, are attracting fans to streaming services and helping power their growth.